Well, it’s the Halloween weekend here and oddly enough I don’t have a spooky image saved up for this. But… bats are suitably Halloweeny, right? 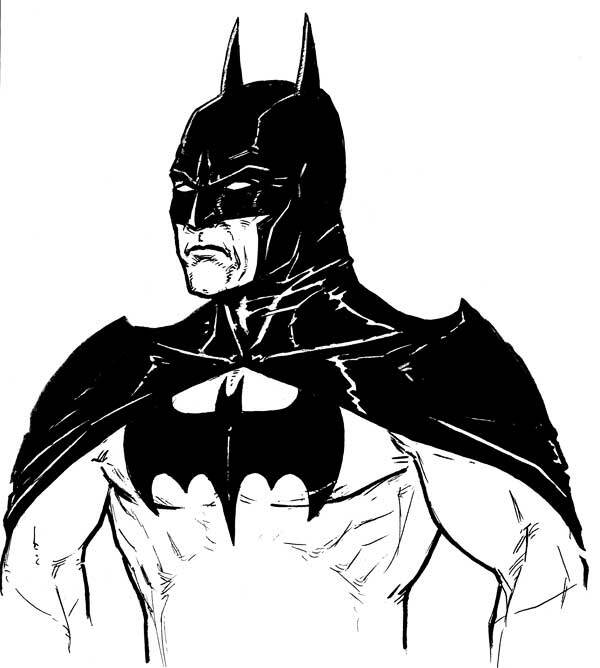 Here’s a doodle of my fave bat – Batman. Hey, I grew up reading comics and while I was much more of a Superman fan as a kid, my tastes shifted towards the Dark Knight as I reached my late teens. I was lucky enough to be attending the U.K. Comic Arts Convention in its earliest days when the pros were pretty easy to meet and I managed to get all 4 issues of Dark Knight Returns signed by both Frank Miller and Lynn Varley! I doodled this up during a recent D&D game. It’s drawn in ball point and Sharpie and the blacks are evened out in Photoshop. Heh, that´s pretty sweet. Try getting a Miller autograph now. I love the sketch. Must´ve been a long game if you managed to doodle this up.